Thousands of health system leaders have descended on Epic’s headquarters this week for its annual Users Group Meeting. 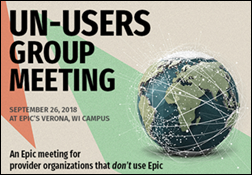 I’m even more curious about the upcoming, first-annual, Un-Users Group Meeting, slated for September and specifically inviting groups that don’t use Epic. The meeting is designed to review options for connecting with Epic-using facilities and for attendees to understand patient-driven mechanisms of data sharing. The Epic-using hospitals in my area have zero interest in connecting with anyone who isn’t part of their respective systems, so I’m not sure that hearing from the vendor would be that helpful. If you’re in an area where everyone plays nice, registration is $100 and the meeting is only one day, so you might be able to fit it into your schedule. Speaking of vendor user group meetings, I’ve attended quite a few in my time and beyond the educational and networking components there is typically a bit of fun. As we’re in the swing of the user group season, let’s all take a moment to review an analysis of alcohol consumption and health risk recently published in The Lancet. Although mainstream media has picked this up as a warning that there is no amount of alcohol that is safe to consume, the facts of the analysis need to be considered. Researchers looked at data on alcohol use and the risk of alcohol-related conditions from people in almost 200 countries and used it to create a global risk profile for alcohol. The authors kindly note that they adjusted for tourism and “unreported” consumption, which is an interesting concept to consider. Not surprisingly, alcohol-related harm was less where no alcohol was consumed, and the risk increased with a rising number of daily drinks from 0 to 15. Because the study used previous data rather than being a new clinical trial, researchers weren’t able to control for other health risks such as smoking or low socioeconomic status. The New York Times brings some sanity to the data in its review of the study. Author Aaron Carroll notes: “Consider that 15 desserts a day would be bad for you. I am sure that I could create a chart showing increasing risk for many diseases from 0 to 15 desserts. This could lead to assertions that “there’s no safe amount of dessert.” But it doesn’t mean you should never, ever eat dessert.” As someone who indulged in a spirit-bolstering piece of gooey butter cake this afternoon, I fully agree. Much appreciation to my Midwest client who introduced me to the delicacy. HIMSS19 registration is open, and they’ve upped the early bird price by $35 to a base of $825 for HIMSS members. Fees are extra for the Health 2.0 VentureConnect offering and various pre-sessions, receptions, and the SeaWorld event. I registered early so I could check one more thing off my ever-growing “to do” list, and was happy that I had booked my hotel weeks prior because my hotel of choice is already sold out. I completed my registration while waiting on a conference line for a client who is chronically late. As a consultant, my meter starts running at the scheduled meeting start time, and the client is on the hook for any wasted time. Of course, if a client has an extenuating circumstance I will typically make an exception, but not for a client who does it all the time and has been reminded often about the time she is wasting. While I was productive, the other people waiting on the call engaged in some fairly un-professional, pre-call banter, despite being able to clearly see that an outside person was connected to the Web conference via both audio and video. I’m cool with chit-chat about weather, sports, weekend plans, kids, and what’s for lunch, but complaining about your boss probably isn’t the best thing to do on an open conference line. Especially when your boss hired the consultant who is chuckling to herself while on mute. A friend clued me in to Paladina Health, which delivers integrated care in a medical home model. 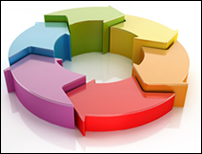 Like other offerings, its goal is increasing value while reducing healthcare spending. However, it leads with a high-touch primary care setting – think concierge medicine as an employee benefit. There’s plenty of technology going on with population health management, risk stratification, and outreach, but the primary physician is empowered to truly build a relationship with the patient, with appointment slots ranging upwards of 30 minutes. Physicians are paid a salary and receive bonuses based on outcomes, patient satisfaction, and cost management. Patients can be seen without paying a co-pay, with the intent of encouraging them to seek care when they need it and not having cost be a barrier. I’m not sure exactly what the physician compensation piece looks like, but it was enough to convince my colleague to leave her part-time, family-friendly position and take on being available to patients 24×7. I’ll add Paladina Health to my watch list and see how they do over the next year or so. For those of you in healthcare IT who don’t have to deal with the revenue cycle piece, think kindly if you encounter stressed-out colleagues who do. There are so many steps needed with appeals, resubmissions, and more, it’s enough to make someone lose their mind at times. CMS is one of the biggest offenders, although I’m currently working with a client who has several payers that are taking more than 52 weeks to pay, leaving the practice holding the bag. HHS filed a brief this week estimating that it will be able to clear the Medicare claim appeals backlog by Fiscal 2022 – but unfortunately, that’s a year longer than stipulated by a US District Court. The issue goes back to a 2014 lawsuit by the American Hospital Association against HHS, claiming that the Recovery Audit Contractor (RAC) program’s slow appeals process violates the Medicare Act’s 90-day appeals requirement. HHS has long claimed that administrative judges are overwhelmed and it doesn’t have the budget to hire more. There are over 600,000 appeals pending, and it’s expected that the number will be over 950,000 by the end of Fiscal 2021. To solve the problem, HHS plans to use over $180 million in additional funding to hire enough judges and staffers to more than double the number of appeals it can process annually. I’d love to see some provider-side data on what those appeals and delays cost those who are providing care. I’m betting there could be some serious savings if healthcare organizations didn’t have to hire staff to chase their payments. What’s the longest delay in payment you’ve seen? Leave a comment or email me.